PHOTO BY JACOB GURNEY Crews work at the scene of an accident on West SR 18 in front of I.C. Treats Sunday afternoon in Bascom. BASCOM — Three people were injured in an accident on West SR 18 in front of I.C. Treats -N- Things Sunday afternoon. Trooper Allison Young of the Fremont post of State Highway Patrol said Mimi Green, 21, of Fostoria, was traveling in a 2006 Chevrolet HHR west on West SR 18 with Farrah Sferro, 1, of Fostoria. She said Carol Martinez, 62, of Fostoria, was traveling east on West SR 18 in a 2015 Hyundai Santa Fe. Green attempted to turn left into I.C. Treats -N- Things and was struck by the Hyundai, which caused the Chevrolet to overturn on its side. The Hyundai was spun around and came to rest on the road, Young said. 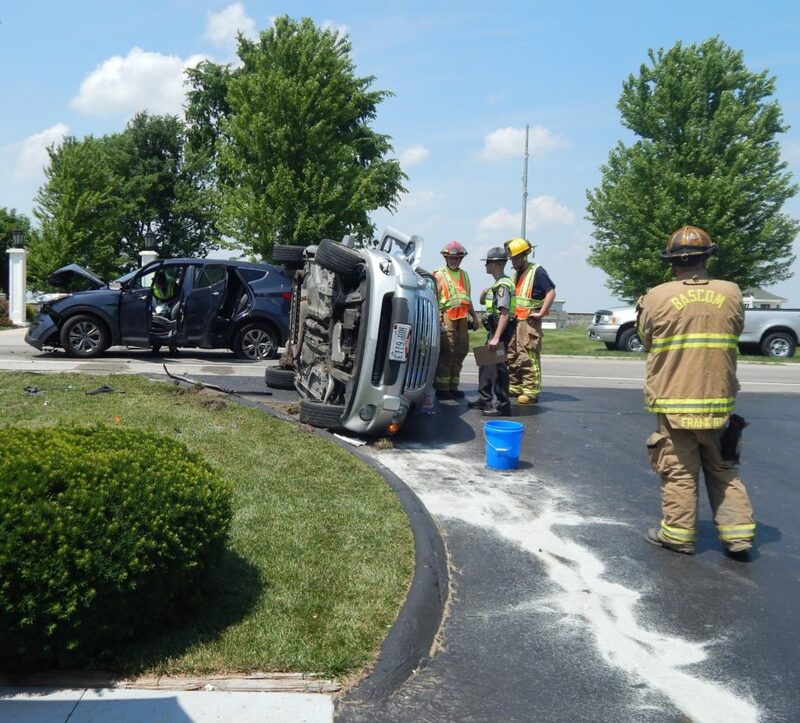 Green, Sferro and Martinez were transported by Bascom EMS to Mercy Health — Tiffin Hospital to be treated for non-life-threatening injuries, she said. Young said Green was cited with failure to yield while turning left. Everybody was wearing seatbelts and Sferro was in a proper car seat, she said. The accident was reported at 2:19 p.m. and Bascom EMS, Bascom Joint Fire District, the Echo unit, State Highway Patrol and Seneca County Sheriff’s Office responded to the scene.